Please contact us for openings or to be placed on a wait list. Substitute Teacher If you enjoy working with children and are looking for a flexible, rewarding job this is it! Fill in for staff on an as available schedule. Contact Dawn at dblair@thechurchonnorthland.com for more details. 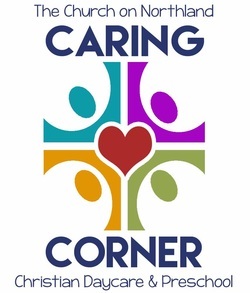 Caring Corner Christian Daycare/Preschool is a full time daycare/preschool and part time Kindergarten Readiness Program based on the principle Jesus stated in Matthew 19:14: "Let the little children come to me, and do not hinder them, for the kingdom of heaven belongs to such as these." Biblical teachings are shared to lead the children to Jesus Christ and help them to grow in their understanding and faith in God. A well-rounded program for spiritual, academic, and social development for children ages 6 weeks to 12 years old. Join us beginning at 3:30 PM. Checks payable to "Caring Corner"